8 Uncle Mo’s went under the hammer at the Magic Millions averaging $114,375.00 the 6 colts averaged $135,000.00 none were passed in with a maximum of $200,000 and a minimum of $80,000. Knightsbridge acquired and Uncle Mo Colt prior to the sale and have the horse at Larneuk Stud and then he will be sent up to Terry Evans, “we thought Uncle Mo would bring big money at the sale so we decided to get in early,looks like that decision really paid off” Joe Heffernan said from the Magic Millions sale, “it has been an incredible sale for Coolmore stallions, they really are producing some high quality horses.” he added. 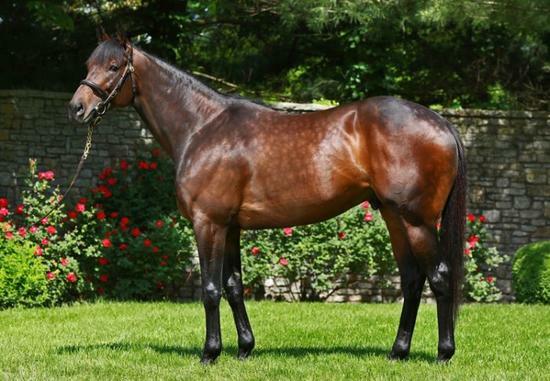 Uncle Mo has wasted no time starting off 2018 with a bang siring two new Graded winners on Saturday in Mopotism (4m Uncle Mo x Peppy Rafaela, by Bernardini) and Ultra Brat (5m Uncle Mo x Prof McGonagall, by Giant’s Causeway). Grade placed on numerous occasions including third placings in the Grade I Starlet Stakes and La Brea Stakes, Mopotism was long overdue to break through with a big win of her own. Trained by Doug O’Neil and ridden by Mario Gutierrez, Mopotism did best in a driving finish to win the one mile $201,035 Grade II La Canada Stakes at Santa Anita by a head. A $300,000 Fasig Tipton 2YO Sale purchase, she runs for Reddam Racing and has the overall record of three wins and six placings from 15 starts with prizemoney of $561,200. “You know, I watched it live and at first I thought she got there but then I saw the replay and thought, ‘oh no! She got bobbed,” J. Paul Reddam said. Mopotism is the 37th stakes-winner for Uncle Mo and is the first winner from Peppy Rafaela, a half-sister to Grade II winner Songster. Already a stakes-winner Ultra Brat, upped the ante when taking out the $150,000 Grade III Marshua’s River Stakes at Gulfstream. Trained by Graham Motion, Ultra Brat was a two time stakes-winner previously, but produced her best work here to win the 1 and 1/16th mile turf contest by a length and three-quarters. It was a great return to form for Ultra Brat who was having her second run back after a long 11 month layoff. “I don’t think we had a specific issue,” Graham Motion said in reference to her time away from racing. A homebred for Alex Campbell, Ultra Brat has won five of 11 starts earning over $272,000 in prizemoney and is a half-sister to Grade III winner It’s Tea Time from Prof McGonagall, who has a yearling colt by American Pharoah.